Climate Change Will Kill Us. When Will We Become Alarmed? World Bank Action Plan on Adaptation & Resilience. 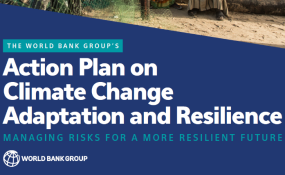 The World Bank Group today launched its Action Plan on Climate Change Adaptation and Resilience. Under the plan, the World Bank Group will ramp up direct adaptation climate finance to reach $50 billion over FY21–25. This financing level — an average of $10 billion a year — is more than double what was achieved during FY15-18. The World Bank Group will also pilot new approaches to increasing private finance for adaptation and resilience. "Our new plan will put climate resilience on an equal footing with our investment in a low carbon future for the first time. We do this because, simply put, the climate is changing so we must mitigate and adapt at the same time," said World Bank Chief Executive Officer Kristalina Georgieva. "We will ramp up our funding to help people build a more resilient future, especially the poorest and most vulnerable who are most affected." Supporting efforts in at least 20 countries to respond early to, and recover faster from, climate and disaster shocks through additional financial protection instruments. "This Action Plan is a welcome step from the World Bank," said Ban Ki-moon, former Secretary-General of the United Nations and co-chair of the Global Commission on Adaptation. "The world's poorest and most climate vulnerable countries stand to benefit from its increased finance and support for longer term policy change." The Action Plan also includes the development of a new rating system to create incentives for, and improve the tracking of, global progress on adaptation and resilience. The new system will be piloted by the World Bank in FY19-20 and rolled out to projects in relevant sectors by FY21. The Action Plan on Climate Change Adaptation and Resilience forms part of the World Bank Group's 2025 Targets to Step Up Climate Action which were launched in December 2018, during the UN's COP24 in Poland. Copyright © 2019 World Bank. All rights reserved. Distributed by AllAfrica Global Media (allAfrica.com). To contact the copyright holder directly for corrections — or for permission to republish or make other authorized use of this material, click here.